We’d love your help. Let us know what’s wrong with this preview of The Leadership Engine by Noel M. Tichy. In this Wall Street Journal and BusinessWeek bestseller, Michigan Business School guru and worldwide consultant Noel Tichy brings his special brand of organisational transformation to a practical level that guarantees a leader at every level of an organisation. Why do some companies consistently win in the marketplace while others struggle from crisis to crisis? The answer, In this Wall Street Journal and BusinessWeek bestseller, Michigan Business School guru and worldwide consultant Noel Tichy brings his special brand of organisational transformation to a practical level that guarantees a leader at every level of an organisation. Why do some companies consistently win in the marketplace while others struggle from crisis to crisis? 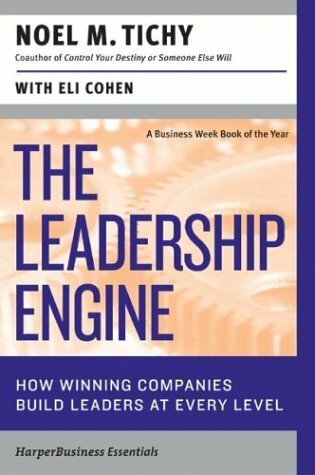 The answer, says Noel Tichy, is that winning companies possess a "Leadership Engine" , a proven system for creating dynamic leaders at every level. Technologies, products and economies constantly change. To get ahead and stay ahead, companies need agile, flexible, innovative leaders who can anticipate change and respond to new realities swiftly. Tichy explains that everyone has untapped leadership potential that can be developed winning leaders and winning organisations have figured out how to do this. To ask other readers questions about The Leadership Engine, please sign up. what chapter and page winning leaders on and what part of the book? The Leadership Engine, by Noel Tichy, is devoted to describing how great leaders push and lead their corporations toward success. Using case studies and research, this book shows that leader driven organizations are more successful, rather than mere manager led. In so doing, the author shows how leader led organizations have traits that lead them towards achievement of their goals. Leaders are so intertwined with the concept of reproducing themselves that they become known for their teaching ski The Leadership Engine, by Noel Tichy, is devoted to describing how great leaders push and lead their corporations toward success. Using case studies and research, this book shows that leader driven organizations are more successful, rather than mere manager led. In so doing, the author shows how leader led organizations have traits that lead them towards achievement of their goals. Leaders are so intertwined with the concept of reproducing themselves that they become known for their teaching skills as much as anything else. The author points out that former General Electric CEO, Jack Welch, would spend several days a month teaching managers. While rarely showing up on the bottom line of organizations, the development of fresh leadership and the growing ability for junior leaders to make decisions on their own without direct supervision are constantly cited as reasons for success in organizations. Over the past generation the occupation of consultant has arisen in virtually every field. From businesses, to churches, to university athletic departments, consultants work where there were previously only outside blue or white collar outside contractors. This book makes the case that consultants exist today because people simply do not want to lead. They have chosen to make their work much more complicated that it had to be by refusing to be teachers of those underneath them. And as a result, leaders have no time to research developing trends or to look long term for their organization. awesome and comprehensive about leadership and change and emphasizes: supporting reasons (the business case), description of TO-BE destination, and how to do this. This book has many times help galvanize my thinking. I re-read it periodically and this time as always I am glad I did. This book is absolutely amazing. I'm a strong believer in leadership and building leadership cultures in a company. For me it's easy to see the companies that will soon die off and the ones that will continue to win by just studying the "leaders" at the company. Even the ones that seem to be winning now will soon fade away because there is no leadership engine. This book also made me appreciate everything Orrin Woodward and Chris Brady are doing at LIFE Leadership. They have created what Tichy w This book is absolutely amazing. I'm a strong believer in leadership and building leadership cultures in a company. For me it's easy to see the companies that will soon die off and the ones that will continue to win by just studying the "leaders" at the company. Even the ones that seem to be winning now will soon fade away because there is no leadership engine. Just finished this one...not as inspirational as some of the other leadership books I've read, but very good nonetheless. It has informed several decisions I have been mulling over regarding the progression of my business. This book is centered on the concept that the world is bigger than any one of us as individuals. In order to succeed, you have to be willing to teach, coach, and mentor. Mentoring requires being vulnerable, releasing some ego constraints, and being honest. Teaching requires the Just finished this one...not as inspirational as some of the other leadership books I've read, but very good nonetheless. It has informed several decisions I have been mulling over regarding the progression of my business. I'm in the midst of developing leadership curriculum for my staff and this is a GREAT look at excellent leaders and their skills in the marketplace. Has given me some great ideas on developing people and myself. the handbook in the index is an amazing resource with great exercises. the beginning of thr book is a bit of a slow starter. A must-read book on leadership for knowledge workers, managers, directors, C-levels, and entrepreneurs. Tichy is a great instructor in the field of leadership.